Climate change is no longer an intangible and rhetorical category: it changes the economic and political map of the world. Leading insurance companies refuse to insure entire regions, referring to climate risks, and scientists argue that global warming will increase the number of wars. The Geneva Association of Insurance Research predicts that some parts of the UK and the U.S. state of Florida are under the risk of becoming "uninsurable" in the very near future. According to the secretary general of the association, John Fitzpatrick, this is just the beginning - the number of such places in the world will continue to grow. In recent years, insurance companies increasingly disagree with governments that try to increase the protection against natural disasters. In the UK, insurers and government officials reached an impasse in the search for a compromise on extending the agreement of insurance protection for events of households flooding. Insurers think that such obligations are now inappropriate. Insurance companies require that the government introduced the scheme of subsidizing insurance for households with high risks. According to John Fitzpatrick, if the authorities take preventive measures, the effects of many disasters such as the devastating floods in Thailand in 2011, whose damage is estimated at $ 43 billion, would be smaller. According to experts, governments shall invest more in flood protection and strengthen restrictions on building in hazardous areas to mitigate effects of devastating natural disasters, such as Sandy hurricane that hit the U.S east coast in October 2012 and cost the U.S. economy about $ 65 billion. Russian insurers finally noticed the problem. In spring his year, Moscow hosted the international conference "Climate Change: Risks and Opportunities for Russia. The Challenge for the Insurance Industry." The forum participants announced data from the German company Munich Re: the number of extreme weather events over the past 30 years has increased markedly. The number of storms, floods, heat waves, droughts and forest fires has increased from 300 in 1980 to 900 in 2012. According to experts, the total damage from natural and man-made disasters in the world was more than $ 185 billion last year. However, despite the magnitude of losses from the wave of hurricanes and natural disasters that swept the world last year, the insurance benefits in the regions untouched by the disasters around the world largely remained the same – it is not beneficial to notice the discrepancy. Scientists from Princeton University believe that one cannot ignore the problems posed by climate change for long: the climate influences not only the economic situation, but also the sources of tension - the climate forces people to take up arms increasingly. For their analysis, the scientists selected 60 studies on the relationship between the climate and conflicts. They considered individual conflicts (fights, murders, rapes), political clashes between groups (civil wars, riots, ethnic conflicts and invasions), as well as cases of sudden and significant changes of ruling regimes or disappearances of entire civilizations. 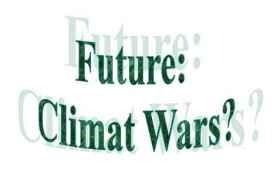 Having examined such a wealth of information, the scientists have come to the conclusion - by 2050, the global warming will increase the number of wars by 1.5 times. Meanwhile, in-depth analysis of the problems predicted by scientists does not reach even the professional communities in Russia. In spite of the very high vulnerability of its "extreme" regions - the South, Polar region and coasts - Russia on the whole still looks relatively good in terms of climate – it does not sink in water like Tuvalu... However, the consequences of the increasing number of accidents and disasters, the invasion of climate refugees already excite our country. Unluckily, there are no adaptation programs yet.